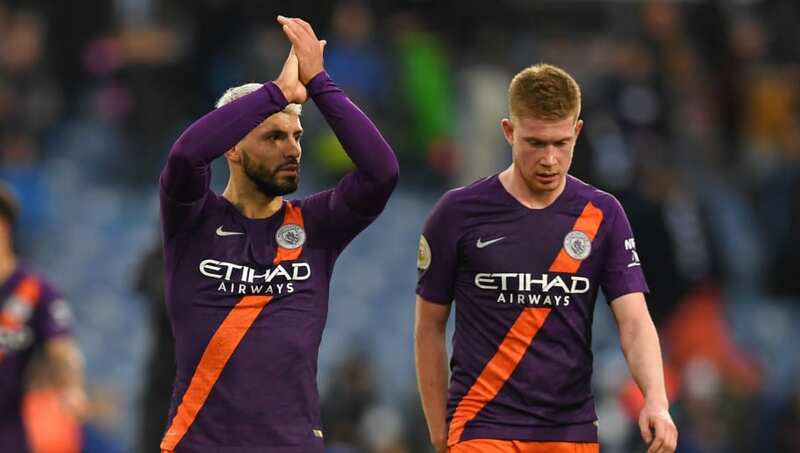 ​Manchester City are set to rest star striker Sergio Aguero for their FA Cup semi-final clash against Brighton on Saturday, while Kevin de Bruyne has admitted that he may be restricted to a bit-part role for the remainder of the season. Pep Guardiola's side face Brighton at Wembley in the next crucial step towards their push for an unprecedented quadruple, though the Citizens have some key injury troubles to contend with. Aguero has been struggling with a muscular problem and may not be risked on Saturday. City, who have a crucial Premier League clash against ​Tottenham on the horizon, now trail leaders ​Liverpool by two points - albeit with a game in hand. Guardiola said of ​Aguero via the ​Mirror: "Sergio is going to play when he's really, really fit. "The doctors are going to tell me tomorrow [Saturday] if he's at risk of being injured and after that whether it could be three or four weeks out. If that is the case, I'm sure he's not going to play. "It's a semi final. It's an important game and we'll play with the best side possible." Aguero recently missed out on City's 2-0 win over ​Cardiff on Wednesday through injury, though the champions' top scorer has travelled to London with Guardiola's squad ahead of the clash against ​Brighton in the hope that he may be able to feature. Meanwhile, ​Kevin de Bruyne has also struggled with his own injury troubles for much of the season, leaving Guardiola without his side's chief creative force for large parts of the campaign. However, the Belgian may be set for more involvement in the remainder of City's crucial run-in. "The season is what it is," De Bruyne said of his fitness struggles, as quoted by the ​Mirror. "I've been injured and had to come back three or four times now. I'm very happy to play again and hopefully I'll be fine until the end of the season. PEP  Now is a joy, and incredible moments - I am more relaxed, you have to enjoy these moments. Now is the moment to enjoy things. To try and reach the FA Cup final - what pressure is that? No pressure at all. "I don't know what my level is going to be but, to be fair, I don't really care. Now it's the business end, I just need to do what I can do to help the team win games. If that means playing five games or 10 games, I'll take it. It's been that kind of season. "I feel sometimes my season had double the length of other players, because every time you need to be in, you need to make almost double the hours. You never have a day off, because you need to work on your recovery. "It's more draining than to play. A lot of the time you're alone, but you have to do it."